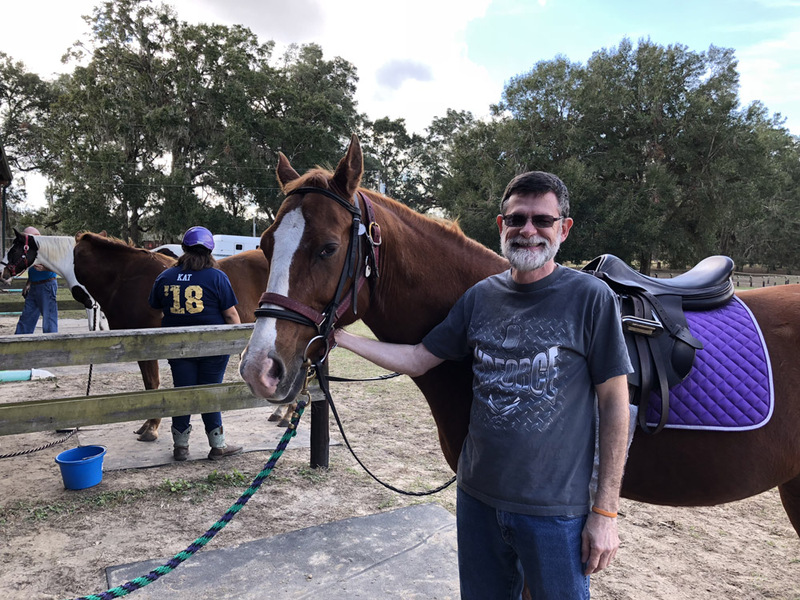 MTRA is proud to partner with the Multiple Sclerosis Foundation to provide therapeutic horseback riding to individuals who have Multiple Sclerosis (MS). With the funding provided by the MS Foundation, MTRA is able to provide 9 participants 1-hour session per week over 10 weeks . Currently there are 9 riders in the program. For people with MS, the motion of the horse will target primary issues including core weakness, balance issues, coordination problems and leg weakness. The lesson includes many components that include not only a physical workout but a mental workout as well. 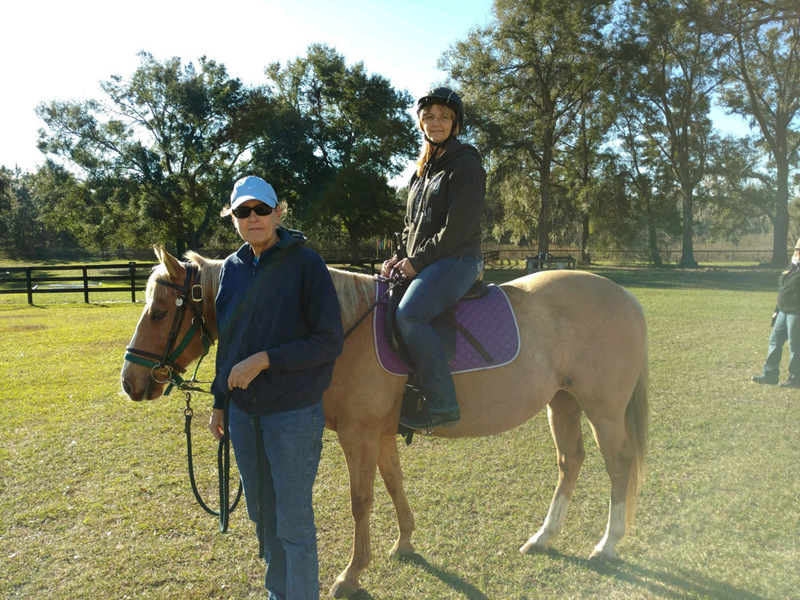 MTRA’s MS riders have all reported that therapeutic riding is helping them manage their symptoms better, as well as gets them out of the house to socialize with other MS patients. For more information on the program contact Pam Morrison, Program Director at pam.morrison@mtraoala.org or call the office at 352-732-7300. Forms for our MS riders can be found on our Forms Page. 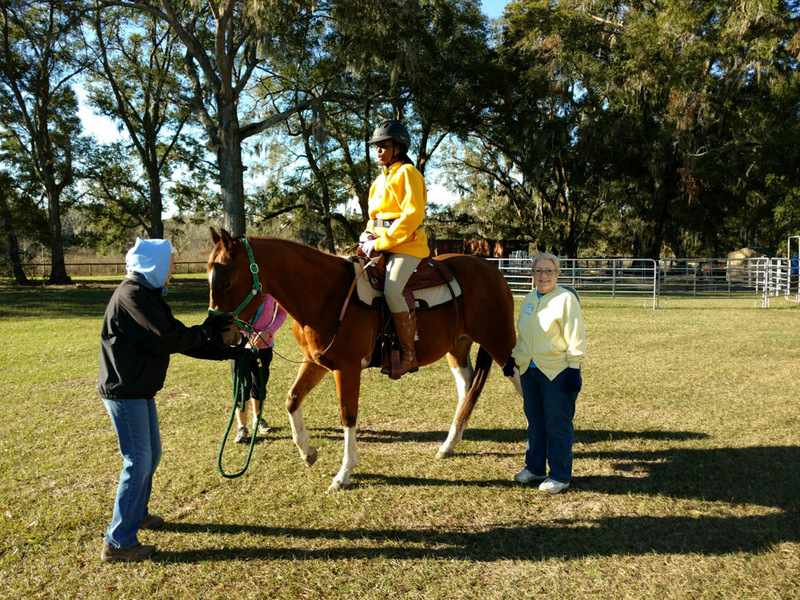 It was a very cold, windy day in a barn in Central Florida as a group of 15 MS’ers, many with their care partners, was bundled in heavy jackets and gloves to hear a presentation about therapeutic horseback riding. 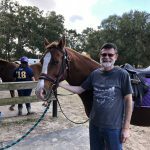 That February morning, we were sitting in an open barn at the Marion Therapeutic Riding Association (MTRA) which is located in Ocala, Florida, an area noted for its horse farms. We were there preparing for a 10-session, once-a-week course. This opportunity was provided to the members of the Marion County MS Support Group (MCMS) and The Villages MS Support Groups (MSVP) with funding from Teva Neuroscience and facilitated by the MS Foundation. The success of the program is made possible by a paid staff of PATH International certified instructors and MTRA staff members who direct the program, and more than 100 dedicated, caring and infinitely patient volunteers who make the program both possible and enjoyable. Our featured speaker was Dr. Seema R. Khurana, D. O., a physiatrist with the University Of Miami Miller School Of Medicine. Dr. Khurana is one of six physiatrists in the United States with special training in Multiple Sclerosis. As a physiatrist, Dr. Khurana coordinates patient therapies including occupational, therapeutic and speech therapies to maximize benefit to the MS patient, and she recognizes therapeutic horseback riding as a positive therapy for the MS patient. After Dr. Khurana spoke, the MTRA Program Director described the program. She started by asking “Why a horse”? Both the shape of the horse’s back and the horse’s movements make it a good choice. Sitting on the horse can stretch hip joints and reduce pain and spasticity in the muscles of the legs. The horse’s pelvis moves in the same three ways as our pelvis– up and down, back and forth and side to side. Therefore, the movement of the horse simulates the way we walk. While riding, the movement of the rider’s hips can increase limberness in their legs and can increase muscle tone. Riding can also improve balance, strengthen core and leg muscles and improve coordination and posture. It can improve general feeling of well being, self control, and self esteem that come with learning a new skill while having social interaction among other riders and between the rider and the horse. When she finished speaking we were fitted for a helmet and horse. I had never ridden a horse so I was excited and apprehensive as I began the ‘fitting’ process. Each participant is assigned a particular horse based on their mobility. The horse is led into a narrow lane formed by two saddle-high raised platforms; one on either side of the horse for easier mounting. After mounting their horse, stirrups are adjusted and stirrup lengths and helmet size are noted for future sessions. We signed up in groups of five riders for the classes which would begin the next week. The following Friday, five of us arrived for our first hour-long class. Each session begins with the rider brushing their horse. This introduces the rider to the horse and is soothing for both rider and horse. After mounting their horse, each rider is evaluated according to their abilities to see if additional accommodations are needed. The staff and volunteers work individually with riders who need additional assistance. For those who experience balance and/or spasticity problems, accommodations can be made to make them feel more secure. A rider who leans to one side, because of tightness in the muscles on one side of their body, may wear a belt with handles on each side which allow the side walkers to straighten their body as they ride. For some, sitting straight feels like they are too far to the opposite side and feel like they are falling, but with help from the well-trained volunteers and instructors, they work together to overcome this feeling and gain confidence. The staff is expert at accommodating for individual needs. Most ride with English saddles, but those who have difficulty sitting on a saddle ride on a blanket without a saddle. One of our riders who experienced spasticity in her right leg and hip could not stretch her right leg and hip across the horse’s back to mount from the traditional left side. Therefore, the horse was backed into the boarding lane and the rider was able to mount her horse from the right, throwing her left leg across the horse. This rider also said that the muscles of her leg and hip relaxed during the session. Although I was a bit fearful at first, I realized it is important that I trust the well-trained professionals (which includes the horse) to provide for my safety. We ride under a large covered pavilion with a volunteer walking the horse on a lead and two side walkers. We ride around the pavilion while we get used to the feel of the horse’s movement. We focus on the position of our body and maintain good posture. After circling the pavilion several times while getting comfortable with the movement of the horse, we ride to the center of the ring, release the reins and begin upper body exercises and stretches. This not only works the arms, but encourages good posture and balance while strengthening the muscles of the torso. Throughout the class the instructors coach us on our position in the saddle and stress that each of us should progress at the level of our ability. If we have pain, muscles spasm or other discomfort, we stop riding while we adjust our position or stretch the affected area to relieve the problem. In addition to working our upper body, we work the muscles of the thigh and leg. As our horse approaches a narrow board on the ground, we push our body off the saddle and sit when the horse steps over the beam. We repeat the exercise. Lifting off the saddle by pushing into the stirrups works the muscles of the thigh and leg. Another exercise for leg strengthening is the two-point position which involves grabbing the horse’s mane, leaning forward over its neck and pushing our body off the saddle into a position similar to a jockey’s. We learn to control our horses by using the reins and our knees and with commands of “Walk on”, “Back” and Whoa”. We practice turning by navigating around a series of small cones placed in a line, then riding to the right of the first one, to the left of the second, etc. When the class is over my legs are tired, but I enjoy the time I spend at MTRA and am proud of what I have accomplished. In a recent conversation with her neurologist, Francee F. thanked him sincerely for signing the papers allowing her to take the class. “Except for water for walking, there is nothing better that I do. I am very thankful. When I moved here (to The Villages) I used to do line dancing. Now I do ‘mostly sitting’. I enjoyed this so much, I went even when the weather wasn’t good” (too hot or rainy). The four riders in our group who completed the 10-week session are looking forward to participating in the fall session when it will be cooler. One of our riders left the program two weeks early for surgery, but hopes to join us in the fall. 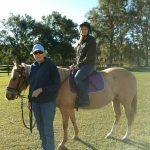 If she is not medically cleared to ride, she would like to join us to renew the friendships she made and to spend time with her horse. On behalf of our riders, I would like to thank the MS Foundation, Teva Neuroscience and Jean McGrail, Facilitator of the MCMS Group, for making this program possible and for introducing us to an experience which we never thought would be possible.